With a growing population, the disposal of treated water became a concern to Council in 1993. For many years the treated water flowed into the Mount Barker Creek and the impact on the ecology of the creek was becoming an issue. Upgrading of the waste water treatment plant began in the late 1990s and included plans to build the large artificial wetland to filter the water further and reuse it for local irrigators, parks and gardens. Birdwatchers will be delighted with a good range of water birds and other species to be seen close up. 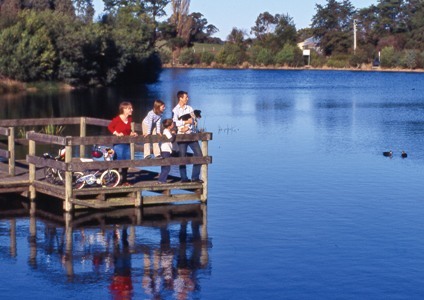 The wetlands are one of the most successful and most diverse artificial wetlands in Australia and unique to South Australia. Before they were established only a handful of bird species were seen in the area. Today more than 140 species visit with more than 40 species known to breed on the site. A picnic area has been developed with barbecues, picnic tables, benches, shelters and toilet facilities, with plenty of seating provided around the wetlands to cater for the elderly and young. Picnic area, Barbeques, Toilets, Benches, Shelters, Bird Hides, Walking trails and plenty of seating around the wetland.